Our goal: Prevent and confront war/ armed conflict. We advocate an international Human Rights approach, integrating peace and security with women’s human rights. Why: We seek to change the conflict narrative thus solving its root causes. How: WILPF links rights, justice, participation, disarmament and development locally, nationally and internationally as our integrated approach to peace. 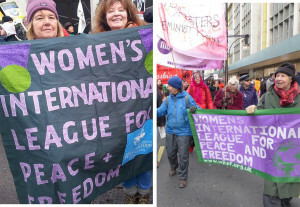 In the UK, WILPF tracks the Convention for the Elimination of Discrimination Against Women (CEDAW), campaigns against TTIP and works with asylum seekers, refugees and trafficked women.